Where can you find free wigs during cancer treatment? Thankfully, there are several organizations which offer free and discounted wigs, as well as other head covers such as scarves and hats for those going through cancer treatment. Chemotherapy can fight cancer but often causes hair loss as well. Chemotherapy drugs are designed to attack rapidly dividing cells like cancer cells. Unfortunately, some normal cells in our bodies, such as those in hair follicles, divide rapidly as well. Hair loss, though not serious in a medical sense, is one of the more dreaded side effects of chemotherapy. Some chemotherapy drugs are more likely than other to cause hair loss, but complete hair loss is usually the norm rather than the exception for people receiving adjuvant chemotherapy for early-stage breast cancer. The chemotherapy drugs used for metastatic breast cancer also commonly cause hair loss. Radiation therapy to your head (for example, for those who have radiation therapy to the head for brain metastases) can also cause hair loss. That leads us to the need for a popular head covering—a wig. It's important to note that hair loss related to radiation therapy—unlike that with chemotherapy—is often permanent. A wig can cost from 40 dollars to thousands of dollars. But when your budget is already strained by the cost of surgery and other cancer treatments, even a 40 dollar wig on sale may seem out of reach. Fortunately, there are ways to find free wigs. You may wish to take advantage of free wigs and hair covers, but if not, there are a few other things to keep in mind to reduce your out-of-pocket cost. After all, few people decide to lose their intentionally so they can wear a wig. Many insurance companies cover all or part of the cost of your first wig. In order to do this, they usually require that you have a written prescription from your oncologist for a "hair prosthesis." Every penny helps when you are facing cancer, and whatever cost you need pay yourself for your wig can be a tax deduction. Make sure you keep track of tax-deductible cancer expenses, including the cost of your wigs, hats, and scarves. Here are five places to look for a free wig during cancer treatment. Depending on your location, you may have local organizations which provide free wigs as well. You can ask your oncology nurse where others have found free wigs, hats, and scarves. The organization Friends are by Your Side provides free wigs for women and children facing cancer all over the world. In order to find a wig, you can check for the salon which is nearest to you. They also provide styling services in order to help women feel in control of their appearance during treatment. The organization Lolly's Locks was formed with the concept that looking good can truly help you feel good. Lolly's Locks provides high-quality stylized wigs to those who could not otherwise afford them and is the only organization which provides customized wigs free of cost. Thus far they have donated wigs to women in 47 states. The American Cancer Society accepts donations of wigs, which they collect in wig banks at their local chapters. These wigs have been cleaned and kept ready for use. If you have no health insurance and are in need of help, contact your local American Cancer Society office and ask about patient services. Some of the wigs are distributed through ACS and some are given out at local Look Good Feel Better meetings, along with cosmetics and head coverings. The organization EBeauty Community accepts donations of used wigs and provides them to women going through cancer treatment free of cost. EBeauty Community joined forces with Look Good Feel Better in 2015 and currently provides around 5,000 wigs to women with cancer each year. As part of their Women's Cancer Program, CancerCare offers financial assistance and counseling, support groups, and patient education. They also provide free wigs and breast prostheses to women who have lost their hair or a breast as a result of their cancer treatment. Some local affiliates of Susan G. Komen provide free wigs. Call your local chapter to see if wigs are offered in your area. Many cancer centers take donated wigs and make them available free of cost to those beginning breast cancer treatment. For example, Standford has a wig bank, and many other large cancer centers have similar programs. Call your cancer center and ask what options are available. Some people prefer to wear a scarf or a hat instead of a wig. Wigs can be irritating and itchy, and very hot in the summer. Even if you decide to wear a wig most of the time, it's still nice to have some hats and scarves on hand, especially when relaxing at home. Learn about some of the organizations which provide free hats or free scarves. As noted earlier, though hair loss is not usually serious from a medical standpoint, it can be very painful emotionally. There are a few practices which have helped some people cope. One is to visualize the chemotherapy drugs killing off cancer cells in your body as your hair falls out. As the last remaining hairs fall, you might think of the cancer cells in your body having one last stand before being eliminated. Some people find it helpful to practice "reframing" when they are struggling with hair loss. Reframing is a process in which a situation doesn't change, but your reaction to it does. For example, instead of tearfully looking at your head in the mirror, you might find it pleasing that you don't have to shave your legs (or pluck those pesky chin hairs) for several months. When your hair has grown back and you feel ready to show off your chemo curls, donate your wig to a cancer support organization, so someone else can enjoy it. If you have trouble finding a place that will take donated wigs, contact your local hospital and ask if they have a cancer clinic—they may be looking for donations of cancer care items. You may also donate money to registered charities that supply wigs to women who are in treatment for cancer but cannot afford the price of a wig. 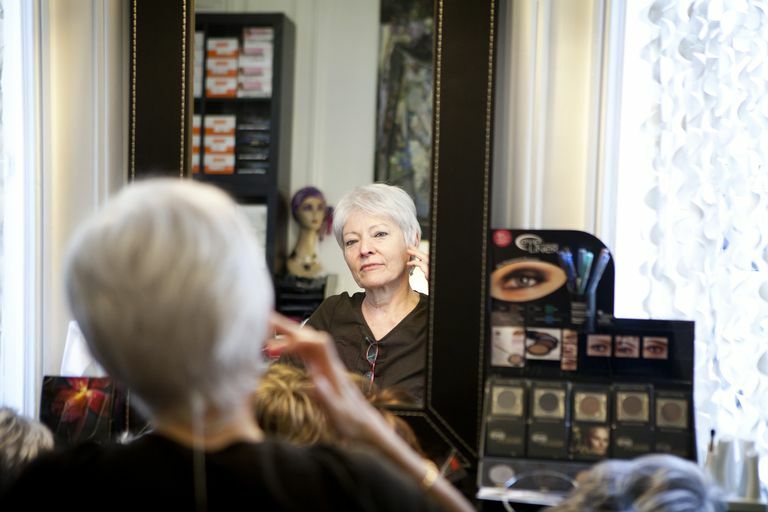 Having a flattering wig can help a woman feel that she looks attractive—this can lift her spirits greatly during a time when she is fighting cancer. After a wig has served you well, consider giving it a new life with another survivor. Many people find it difficult to cut their hair once it finally grows back. If you have felt the difference between real hair and synthetic hair, you know that there's nothing like the real thing. Some people purchase or get free a synthetic wig, but enjoy the thought of donating their hair so that someone less fortunate can wear a real hair wig. National Cancer Institute. Self-Image and Sexuality. Zdenkowski, N., Tesson, S., Lombard, J. et al. Supportive Care of Women with Breast Cancer: Key Concerns and Practical Solutions. Medical Journal of Australia. 2016. 205(10):471-475.